I thought of adding an automatic blast gate system to my shop every time I forgot to open/close a gate. (I actually thought I’d stop doing that, but I didn’t.) Then I saw the review by pintodeluxe (aka, Willie) and I decided to do some more research and eventually purchased the system through Infinity. The technician at iVAC (Dave) was extremely knowledgeable and always courteously responded to my questions, from pre-purchase to set up. 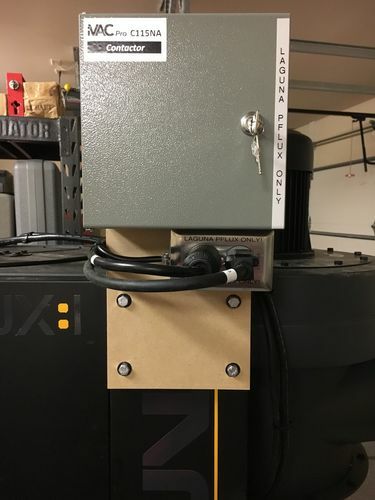 I started by mounting a piece of 3/4” painted plywood to my Laguna DC. As that 2hp unit draws 12 amps Dave recommended I install a Contacter unit between the switch and the DC (it’s the grey box above the yellow switch in the photo). I believe it is a heavy duty switch that can take the 12 amps without worry of damaging the iVAC system. The system was easy to wire up and install. The components are very heavy duty. And, it all works as advertised. I have an auto gate on four machines. I didn’t see the need to have them on a few other machines, but did buy the iVAC Remote to operate the DC for the manual gates. I would recommend this to anyone who is tired of forgetting to open/close manual blast gates. BTW – be sure to check out the video from pintodeluxe, https://www.youtube.com/watch?v=HlHoE_1pJAE. He gives a great explanation of how the unit is actually set up. Wood working keeps getting better and better- nice operation. I’ve been using the iVac system for almost a year now and I couldn’t be happier !!! I installed the three gate system to cover my table saw, router table and wood lathe. I have a Jet dust collector with a 1 1/2hp motor, and also decided to go with the Contactor unit. The system is easy to set up and I haven’t had any issues at all. I will definitely be purchasing another controller for my other dust collector and gates for remaining power tools. Couldn’t agree more! I’ve now had mine for less than two months and still very pleased! Looks like a great setup. Do you still recommend the iVAC Pro setup? I was trying to make sense of the iVAC Contactor and how it was wired. Can you confirm that it is wired to your dust collector; wired to plug into the iVAC Pro Switch; and then wired to plug into an outlet? 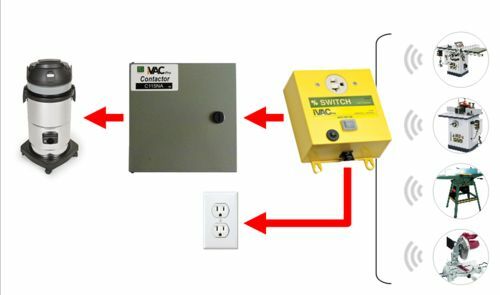 If so, does the outlet that you plug the iVAC Pro Switch into have to be on a different circuit than the outlet you plug the iVAC Contactor into? In short, could it be the same outlet box on the same circuit? And please excuse my ignorance as I work through this. Here is a basic schematic from iVac that may help. The contactor is only required for dust collectors larger than 2hp. I’ve been running ivac gates and sensors on my 2hp Tempest cyclone and have been very pleased. I don’t use a contactor. 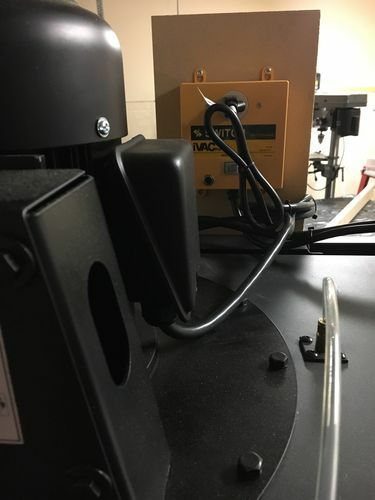 Two reasons I really like these systems… They make you use your dust collection every time, and the convenience really improves workflow in the shop. I absolutely would still recommend this system. It works very well for me. Suggest you contact the iVac tech, believe his name is Dave. Very helpful and will respond to you very quickly. Very knowledgeable and helpful. Wouild I still go the contactor route? YES! Wiring was easy. I have one 120v plug to the wall for controlling the unit and one 220v plug to the wall for the DC itself. Don’t cheap by trying to cut corners, you’ll pay later. I absolutely would still recommend this system. It works very well for me. Suggest you contact the iVac tech, believe his name is Dave. Very helpful and will respond to you very quickly. Very knowledgeable and helpful. Wouild I still go the contactor route? YES! Wiring was easy. I have one 120v plug to the wall for controlling the unit and one 220v plug to the wall for the DC itself. Don t cheap by trying to cut corners, you ll pay later. May I please see a photo of the inside of your Contactor? Yes, I’d still recommend the iVac system. I provide power to the iVAC Pro Switch from a circuit separate from that which feeds the DC. 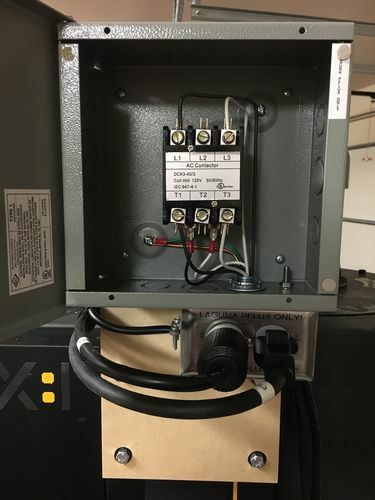 One circuit (120v) feeds the Pro switch, gate controllers and gate power; the other circuit (120v) feeds the 1 1/2hp DC thru the Contactor relay. I provided a photo of the box interior, obviously if your running 220v to the DC the wiring would differ. 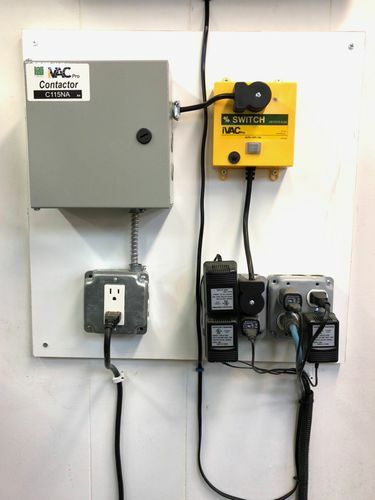 In the above photo, the two workboxes on the lower right are feed from a 120v circuit and are used to feed the iVac switch, gate controllers and gate power. The bliue line leads to a router ignore it. 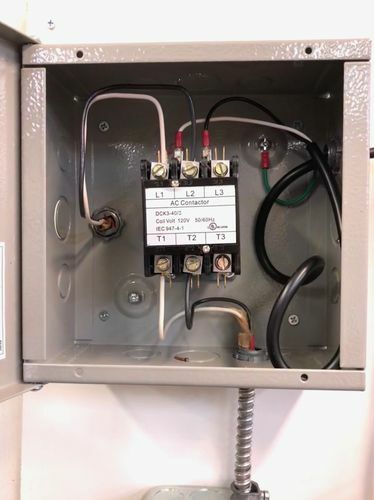 The outlet on the lower left is feed from the Contactor. The DC is plugged into that outlet. Inside the Contactor box … The white and black wires on the far left are 120v coming out of the wall and connected to the contactor terminals L1 and L2. 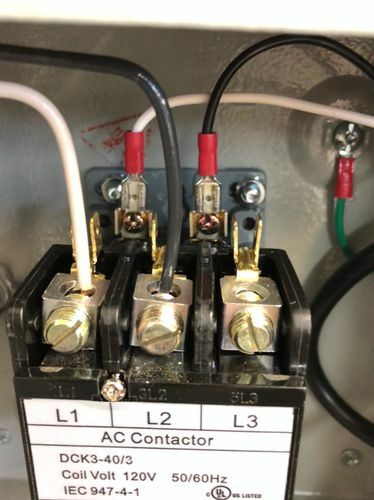 The white and black wires at the bottom of the box are leaving the contactor terminals T1 and T2 and feed the outlet which the DC is pluged into. I opted to plug the DC into an outlet … the DC could have been feed directly. The smaller gage wires (white, black and green) are coming from the iVac switch and provide power to the relay coil when the system is called upon. They are attached to the relay terminals behind the L1 and L2 terminals, and the green wire grounds the box. The following photo gives a better view of those relay terminals. Thank you for posting the photographs. As luck would have it, my contactor is slightly different than every other photo I have seen. 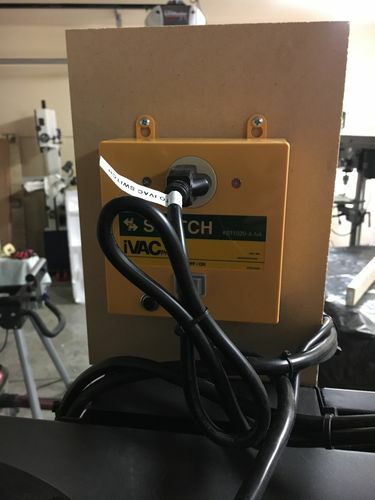 The tabs used to connect the cord that goes to the iVac switch are on the T side of the block. I sent Dave Goddard at Laguna Tools an email and pictures of what I had done and he was surprised about the tabs. 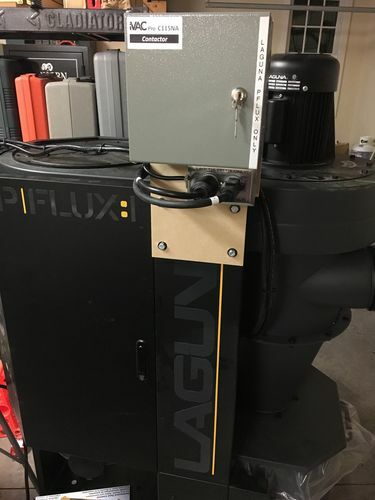 I am lucky I contacted him because he gave me specific instructions on how to install the contactor on my Laguna pflux dust collector. I was nowhere close based on the generic instructions supplied with the contactor. Dave made everything simple! 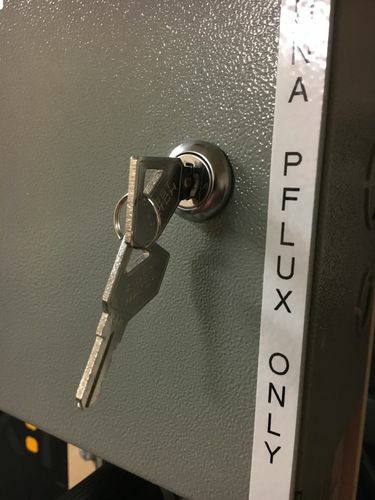 Didn’t realize you were hooking up a Pflex. Which one? I’m kinda eyeing the P3. BTW – I disconnected the IVac from my comp miter saw, too many on& offs. Did add IVac gates to my jointer and planer, very nice! I bought the pflux 1.5 on sale at Christmas. It took about four hours to set up but it is pretty amazing. I chose the smaller version due to wiring in the garage shop. I already added a 220 for the table saw and another for the CNC setup; the panel is getting snug. As for the DC, I am going to run two permanent four inch lines, one along a wall about 40 inches off the deck and one across the ceiling with a drop down for a table saw and another for a miter saw/planer area. I plan to use an automatic blast gate at the drop down for the miter saw/planer area, one at the drop down for the table saw and the third to control the long run along the wall for the smaller tools. If the DC can handle the setup, I will add automatic blast gates as money becomes available. Hopefully the machine will be enough to do a good job. Instead of hard wiring everything inside the contactor, I used a duplex outlet for the T and L sides of the contactor. I did so by separating the side tabs so each outlet is independent. I then ran the T and L wires to the outlets. On the dust collector, I installed plugs on the wires that were suppose to go to the T and L sides of the contactor. I made sure to wire them so everything matched up with the outlets (e.g., black to black and white to white). I then plugged everything in and it worked. I think it turned out pretty clean. 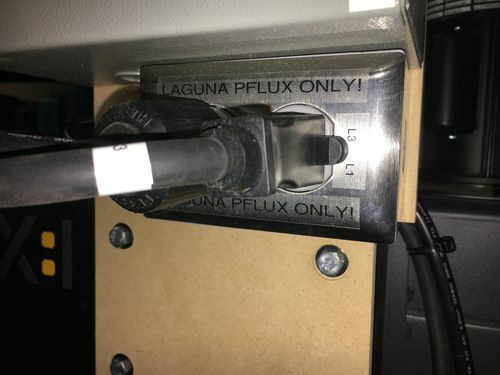 This is a picture of the contactor and duplex outlet mounted on the MDF, which is attached to the Laguna. This is a better shot of it mounted to the Laguna. Here is the inside of the contactor. A cheap lock I added because I could just see a kid opening it and sticking his hand inside. Another shot of the duplex plug I used instead of hard wiring the Laguna to the T and L sides of the contactor. Here is a view of the iVAC switch mounted to the MDF opposite the contactor. A view of the switch looking across the top, behind the motor.